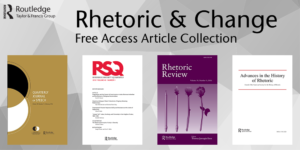 Routledge (Taylor and Francis) is offering a nice collection of articles to mark the RSA conference this weekend: Rhetoric & Change: A Free Access Article Collection in Collaboration with the Rhetoric Society of America (RSA). It looks like a grand collection; however, the fact that you have to read and download everything one-by-one leads me to believe that Routledge is more interested in trying to keep you on their site than actually providing free access to key pieces. A well-designed site would have a “Download All” option. I would have been willing to fill out a short survey and give them my email address for such access. Sure free != easy, but it could and often should. Shame on Routledge!